Protecting the heritage of one of the finest Architectural schools in London is no mean feat. From the influx of international students to the very buildings in which the campus is housed. The complexities of the various insurance policies left Architectural Association’s Company Secretary, Kathleen Formosa, a little perplexed. But she was determined to discover whether the current cover was adequate and if improvements could be made. And so, as the time for renewal approached, Kathleen drafted in the help of Expense Reduction Analysts (ERA) for expert guidance. 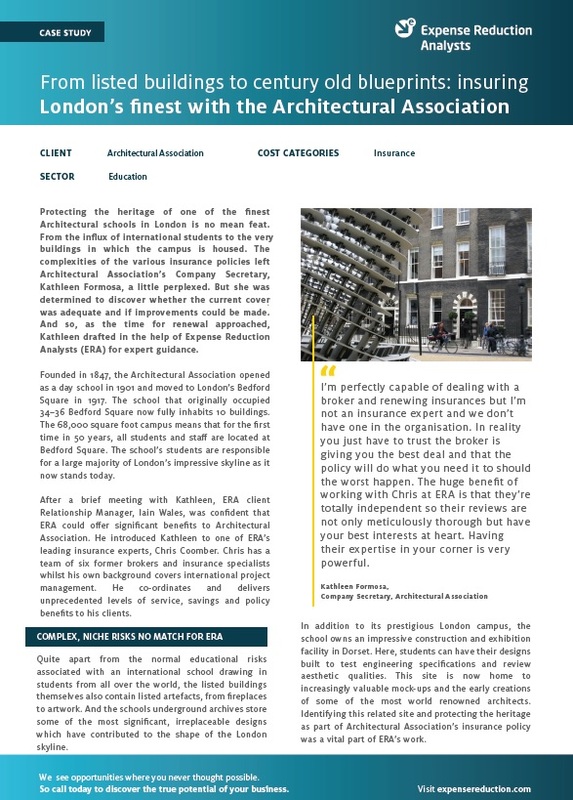 To find out more about how ERA helped The Architectural Association, including results, savings and more details from the client, download the full case study now.